Suffolk Chess: Peter Keffler R.I.P. Peter Keffler, doyen of the Clacton Chess Club, passed away last Tuesday (22 December). He had celebrated his 92nd birthday only a month earlier. In his prime, Peter was a 200-grade player (or equivalent) and had several published games and positions. His most famous win, and one that was celebrated on his 90th birthday cake, was in 1970 when he won with the Black pieces in just 15 moves, playing the Traxler Counterattack (see game below). John Lambert has written the following: "When I arrived at Clacton Chess in the early nineties, Peter was the leading light. His knowledge of chess was extensive, as was his generosity in passing on his skills to others. He had studied at Oxford University and had many games published. He was quoted in Harding & Barden's 'Openings for the Club Player' for his thoughts on the Two Knights Defence. If you have a copy, see page 22 (well worth a look). Peter was influential to me (although starting late I never got near him) as well as juniors at the club in his attacking style of play which made him a match for any player in the Suffolk & Essex leagues. Peter also played County Chess for Somerset, Essex & Suffolk and was a keen golfer. He will be missed by many in the Chess world." Peter was Black and two pawns behind. White has just played R(f1) to d1??. Peter played 18...Qxd1 and White resigned. After 19. Nxd1 Nf3+ to be followed by Re1+ and mate to follow. Peter's well-stocked bookstall featured at many East Anglian events. His diligence in carefully packing away every single book in the correct box caused some anxiety for local caretakers, as well as congress organisers who wanted to get home after a tiring weekend! Peter last played a league game in March 2014. His deteriorating eyesight and general infirmity meant that he could no longer play serious chess. 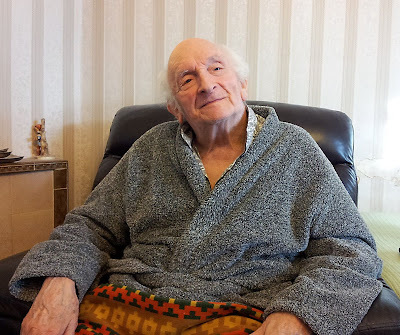 Club colleague Melvin Steele has also written a tribute to Peter on the Clacton Chess club website here. The funeral will take place at Weeley Crematorium at 14.00 on Monday 18 January. There will be no more articles until 6 January (off to the West Country). It is with great sadness that I heard of the passing of Peter Keffler. Peter seems to have been around Suffolk Chess since I I first started playing at Ipswich in the late 1960s and his bookstall has always supplied me with a chess book at every Suffolk congress I can remember attending. As a result my chess library nearly all carry Peter Keffler Chess labels. I have the honour of being the last player in the league to play Peter on 13/02/2013. I do not remember the experience as very pleasurable for me. I won that game but it was an empty victory for I know that I could never have come near Peter when he was playing unhindered. Peter was so impeded by his poor vision, despite the biggest chess set I have ever seen, that I had to be as gentle as possible when telling him that he was moving my pieces. I am sure that Peter's vision was so bad at that time that he played that last game effectively blindfolded. Age had chosen a very cruel way to end an illustrious chess career. I am ashamed to say that I initially coveted that large set but I very quickly felt very guilty as I would not wish to be like Peter and forced to use such a huge set just to see the board.